DESCRIPTION: The Fletcher 1985 Reunion website was designed and developed by PTC Computer solutions. The 30 years since the high school graduation of Duncan U. Fletcher has led to the culmination of the 30 year reunion website for information on the reunion as well as payment through credit card processing methods. 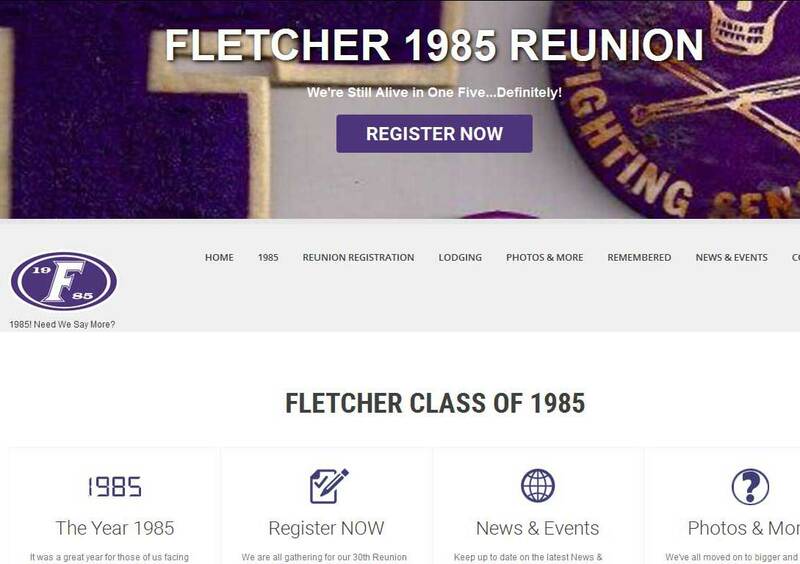 You can find out more by going directly to their personal website, www.fletcher85reunion.com, or contact them directly at info@fletcher85reunions.com. We were so excited to work with PTC Computer Solutions when we needed to develop a web presence to inform our alumni of upcoming reunions, PTC Computer Solutions was willing to step forward and help us out at NO COST to us. They are the best Jacksonville, Florida based website design and development company and have been in Jacksonville longer than any other existing company. They know website design and how to set up a website as well as how to generate buzz and Search Engine awareness through social networking and other online marketing means. Contact PTC Computer Solutions at info@ptccomputersolutions.com if you are interested in your own quality website design. Fletcher High School, though technically in Neptune Beach, Florida, is a member of the Duval County Public Schools. When we needed to develop a web presence to inform our alumni of upcoming reunions, PTC Computer Solutions was willing to step forward and help us out at NO COST to us. They are the best Jacksonville, Florida based website design and development company and have been in Jacksonville longer than any other existing company. They know website design and how to set up a website as well as how to generate buzz and Search Engine awareness through social networking and other online marketing means. Contact PTC Computer Solutions at info@ptccomputersolutions.com if you are interested in your own quality website design.